The XVIIIth century expansion of Vienna led some of the most prominent families of Vienna to build immediately across the meadows which surrounded the walls a second residence where they spent the summer and entertained in the open air. By reading the names of the dignitaries and ministers to whom in 1713 Emperor Charles VI announced the Pragmatic Sanction, one obtains an almost complete list of the villas built around old Vienna. The Trautsons were a family of the Erblande the Austrian Habsburg "hereditary" lands (Bohemia, Austria and Carniola, today's Slovenia) and they greatly profited from the expansion of the empire after 1683. At the court of Charles VI, the Prince of Trautson was second in rank, immediately after Eugene, Prince of Savoy, the commander of the imperial army. This villa, and not this one only, was designed in 1710 by Johann Bernhard Fischer Von Erlach with a flat roof and a long balustrade, but because weather conditions were pretty different from those prevailing in Italy, it was eventually given a pitched roof. 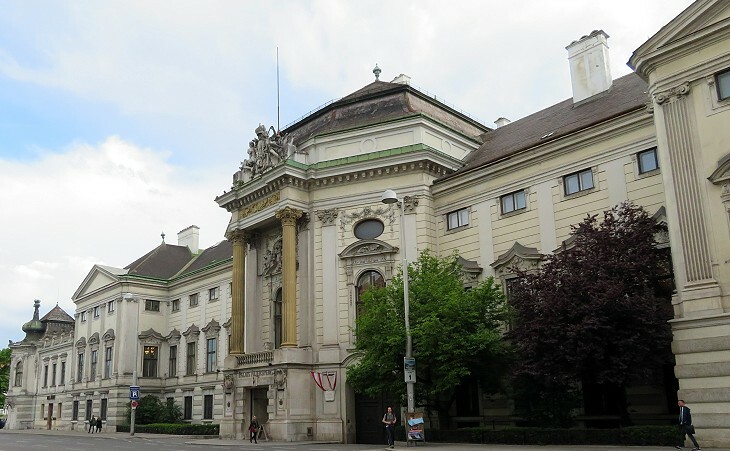 The main façade is actually a lateral one, but because it was facing Vienna it was decorated in a grand manner. The architect, notwithstanding the richness of the decoration, gave it the classical composure of a Venetian villa designed by Palladio. The purpose of the building is clearly spelt out in the decoration of the tympanum: the Trautsons met here with their guests to play some good music, to listen to some distinguished poets and ... to do some other things. In 1727 another villa was built close to the Trautson one: it was designed by Giovanni Christiano Neupauer who is said to have followed a project by Johann Bernhard Fischer von Erlach. Its original owner, Hieronymus Capece di Rofrano, was of Italian origin: the fief of Rofrano, in southern Italy, was bought in 1650 by a certain Girolamo Capece, who forgot to pay for it and had to return the fief to its original owner. By this doubtful transaction the Capece acquired the title of marquis of Rofrano. In 1777 the villa was bought by the Auersperg family, rich landlords of Carniola. Today Trautson and Auersperg are united in the Auersperg-Trautson family, whose members appear in almost all (enlarged) European royal families. Prince Eugene of Savoy built in two stages on the slope of a hill to the south of the walls a villa to which he gave the Italian name of Belvedere, because it offers a fine view over Vienna. The gardens and the larger Upper Belvedere Palace clearly show a French influence, while the Lower Belvedere has a more Italian design: the architect of both palaces was Johann Lukas von Hildebrandt: the Lower Belvedere was built in 1716, the Upper Belvedere in 1722. The villa was eventually acquired by the imperial family and the double-headed eagle of the Habsburgs replaced the cross of Savoy in the coats of arms at the entrance of the Upper Belvedere: but only on the side seen from outside, because the other one retains the symbol of the prince: the lion is a symbol of the Savoy house too. The Habsburgs did not build their summer residence until 1749 and when Empress Maria Theresa decided to do it (Schonbrunn Castle), also because the political hostility towards France had come to an end, she definitely took Versailles as a model. While the Belvedere is almost untouched by the development and modernization of Vienna, other villas suffer from being today right on the edge of a very busy road, without that countryside background which enhanced their elegant design. Another interesting XVIIIth century building outside the walls was designed by the Fischer von Erlach (father and son) in 1719-23 to host the imperial stables. It is an immense building, now used for cultural purposes; its many entrances and also the internal archways have all the same decoration, although with slight variations: the head of a happy, almost garrulous horse next to its threatening armour. The image used as a background for this page shows a detail of the decoration of Villa d'Este.